Join the wave and try one of Unravel's summer trainings! Standup Paddleboarding is one of the fastest growing sports in the world and females are a large part of that momentum. Females are leading the way in providing SUP instruction and turning out incredible results in short and long distance SUP racing and SUP surfing competitions. Grab some friends and come join Unravel for a night of skill-building fun. It's ok if you've never tried SUP before or if you've only tried it in warmer waters while on vacation or only on our local lakes. This class is designed to walk you through everything you need to know to SUP safely in local waters and become a stronger paddler. In three hours, we will learn and build on to basic SUP skills including launching, standing, stroking, turning, rescuing, and exiting. This clinic will allow students to explore SUP and provide them the confidence and competence to become stronger paddlers with an awareness of Alaska’s cold water conditions. Beginners welcome even those who have never tried to SUP before. However, students must be comfortable on the water and proficient at swimming over 25 yards in Anchorage lake water. 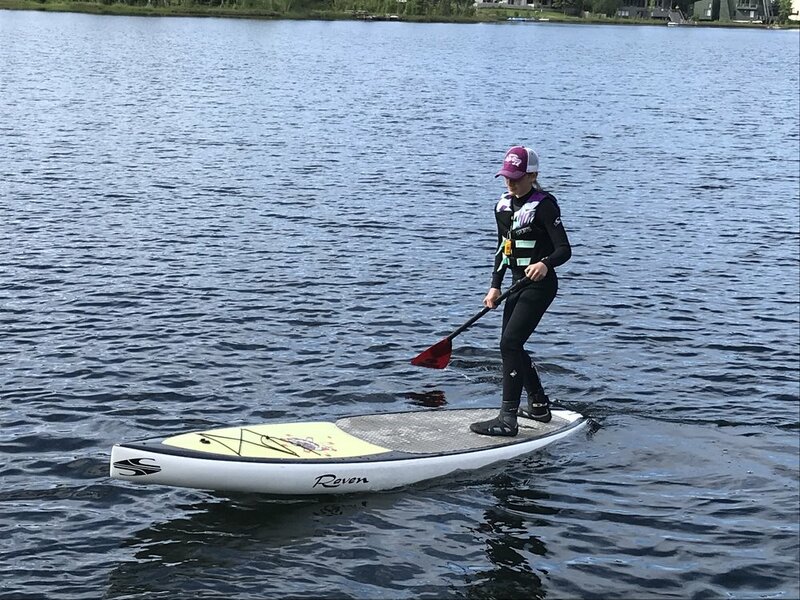 Sami Glascott, Paddle Into Fitness and World Paddle Association Master SUP Trainer, will lead these clinics with the assistance of local Paddle Into Fitness SUP teachers. Bringing your own gear? Students must have a good fitting life jacket, whistle, SUP, paddle, and leash, otherwise they will not be allowed to join the class. We will work on developing beginner stroke skills into more advanced stroke techniques that allow for long and strong paddles. We will also practice turns and learn racing techniques. Newer students will walk away feeling stronger and more confident about SUP and more experienced students will be ready to integrate SUP into their cross-training, try a long excursion, or try a SUP race. Note: This class is not a first-timers class. You must be able to swim and have some SUP experience. This class will be a great lead in to any SUP Instructor Trainings/Intensives led by Unravel or continuing practice for recent graduates. Dates: Thursdays, starting June 28 at 6:30-8 p.m. (no practice July 5). Please plan to arrive early to unload, prepare your gear, and be ready to launch by 6:30 p.m. Location:Practice will typically occur at Lil’ Campbell. Please reserve in advance to receive practice updates. Gear: Must provide paddle board, paddle, PFD, leash, whistle, and apparel appropriate to lake water temperatures. Water bottle, appropriate outerwear, and dry clothes. Reservations: Please register by noon on the day of the class. If no more than two participants are registered by noon, instructor reserves the right to cancel the class. Registrants will be called no later 3 p.m. the day of the class. Unravel is available to teach and promote the sport of standup paddle boarding in Alaska. In the past, Unravel partnered with the Alaska Club to introduce SUP and SUP Yoga classes and is currently involved in the Alaska Boating Safety's Kids Don't Float program. Are you experienced and just looking for other SUPers to paddle with? Join Unravel's Facebook page and like the group for Anchorage Stand Up Paddlers. Congratulations! In June, 2018, Unravel certified Alaska's second class of Paddle Into Fitness and World Paddle Association SUP Instructors. Unravel is dedicated to growing a well-educated and highly-skilled SUP teacher base in Alaska (and beyond) to ensure a safe SUP community. 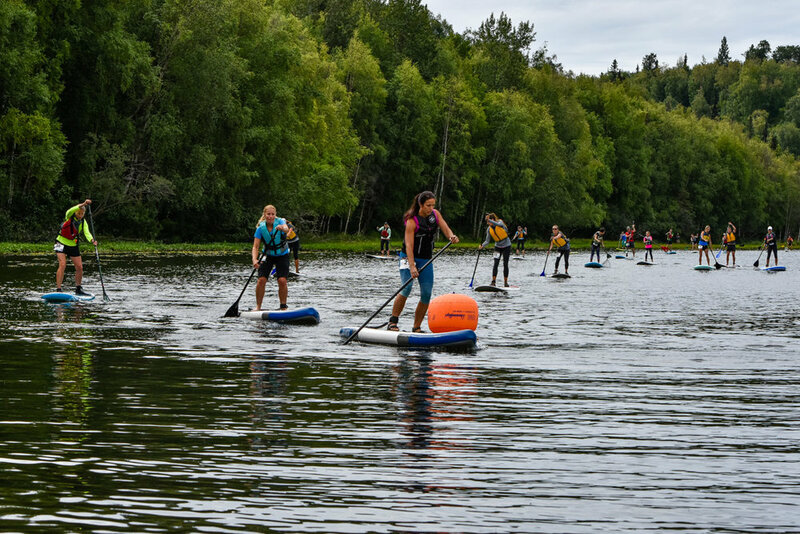 To meet this mission, Unravel has adopted Paddle Into Fitness Instructor Trainings, well-designed, comprehensive California-based SUP teacher trainings, and customized the trainings for Alaska's waters and conditions. These trainings are continuously updated as the sport of SUP evolves. 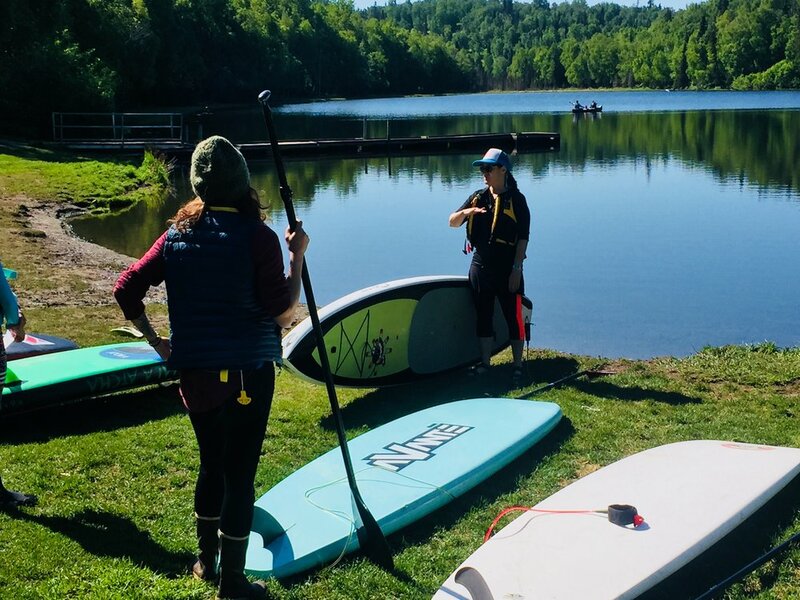 If you have ever wanted to broaden your paddling expertise and/or become a Stand Up Paddleboard (SUP) instructor, then consider Paddle Into Fitness teacher training. This course is also recommended for outdoor programs, schools, yoga centers, marinas, diving and boat rental centers, and resorts looking to certify staff in the fundamentals necessary to execute safe and exciting paddling programs. If you are interested in participating in or hosting a training at your location please complete the form below or contact Sami directly at sami@unravelak.com. All destinations, including international, will be considered. Reservations for 2018 are being taken now. Next Class in Anchorage, Alaska: June 2019. If you want to take a class earlier, please contact Unravel.